Professional photography and visual media services designed to bring your rooms to life. The creation and delivery of high quality, still photography is the basis on which ACT Studios was originally founded. And it continues to play a huge role in our work today. We pride ourselves on capturing images that tell a story. We call it visual storytelling. And we believe that visual storytelling is essential when it comes to marketing your business. Not just because a picture is worth a thousand words. But because we have seen first-hand how effective strong imagery can be in increasing occupancy levels. Did you know that having at least one photo of your property on a property page actually increases the likelihood of a booking inquiry by 225%?! Such is the value of engaging property photography in the increasingly competitive and price sensitive hospitality sector. So how do you go about capturing the very best side of your holiday cottage or hotel? What kind of still photography does ACT Studios offer? Unlike estate agents, at ACT Studios, we do not aim to make every room in your property look bigger than it actually is! There’s no fish eye lenses or trick photography with us. Because it would only disappoint your guests when they arrive. What we do aim to do is create photography that makes your property look inviting from every angle. So if there’s an incredible sea view, we will ensure that the doors are wide open and the viewer feels as though they can step out into the picture to hear the seagulls themselves. We are devils for detail too! We spend a great deal of time making sure each room looks just right. Are the cushions plumped up? Plug sockets all switched off? Seams on lampshades turned round? And is the bed neatly made? We also aim to give you great coverage. We don’t ever limit the number of images you will receive. If your property inspires us to take lots of stills to get the full coverage you need, then we will pass them all over to you. Which areas of my property should I be photographing? There’s no short answer to this but in general, we photograph any and all areas that lend themselves to visual storytelling in some way. Each property is different and whilst guests expect to see all the main rooms covered, we also want to create images that really convey the luxury and feel of a space. Whether that is because the property has a stunning view or perhaps a welcoming log burner as a focal point. Holiday cottage photography typically covers all the main rooms along with exterior shots and any imagery that can really convey the individuality of the property. This might sound obvious but guests will want to see what your very best rooms and suites look like. Including any additional space you might offer for them to relax in. We make sure all the best angles are covered. If your hotel has its own dining facilities, then be sure to cover this too. Showcase the surroundings in their various forms, from a romantic table for two to a larger table laid up for a group booking. If you welcome children, be sure to show this. Don’t forget to include surrounding imagery to convey the feel of your restaurant. And if you can, try to include photographs of the food prepared by your own chefs, straight from your own menu – it’s so much more authentic and enticing than a generic, stock photo. Just as with conferencing photography, it is important to showcase all the facilities your hotel has to offer brides to be, in order that they can clearly and easily plan out their special day. Your guests will often be interested in what the area local to your hotel has to offer. So if there are attractions nearby that are worth a visit, be sure to include your own images of them. Or if your property is situated in a beautiful, rural setting, right away from it all, make sure this is also conveyed in your imagery. Perhaps you have a knock out swimming pool or spa facility at your hotel? Or architecture to stop you in your tracks? Whatever you consider to be your hotel’s unique selling point, make sure it is captured on film and made a feature of online. Our professional team of photographers and bespoke post production editing skills can supply you with high resolution, still photography as well as more immersive 3D virtual tours. We have put together this handy guide on how to prepare for your forthcoming ACT Studios shoot, in order to get the very best results on the day. Find out how this sea view led to unprecedented numbers of bookings! 40 weeks worth of bookings. How should I prepare my property for an interiors photography shoot? Preparing in advance for a photography shoot will help ensure that the day itself goes without a hitch. 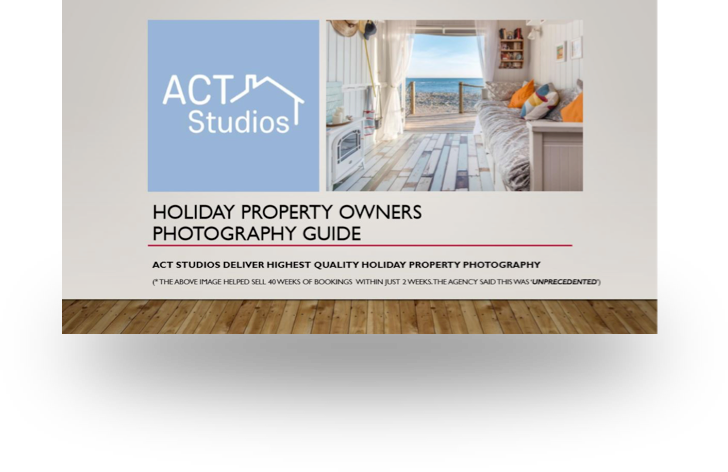 The team at ACT Studios are expert in offering helpful guidance for your own particular location and will liaise with you well in advance, to make sure the whole process runs as smoothly as possible. So if you have a log burner or open fire, make sure it is lit. Check that all the light bulbs are working (we have our own professional lighting equipment but it always looks good to photograph a room with the occasional lights switched on). More and more guests are looking for hot tubs when they hire a holiday cottage, so if your property does have one, then it needs to be fully functioning on the day of the shoot. Hotels will need to ensure we can access their best rooms and guest suites. We will also need housekeeping on hand to ensure that each bed looks absolutely perfect. They say that the devil is in the detail. And for us, this is true! So dig out your best linen, polish the cutlery and lay the table. Flowers make a huge difference. And locally sourced produce can add a thoughtful touch. You might also like to browse our Owner’s Guide to help you prepare for a hospitality photography shoot. Can you edit my property images after the photo shoot? Yes we can! We spend a great deal of time carefully editing each shot by hand for a consistent look and feel. We’re skilled at adding to photos as well as taking away. So if you need us to ‘light’ the fire in your log burner, that’s no problem. Better still, we handle all our post-production work in house. Which means we are fast and responsive to any requests, ensuring that you get the exact look and feel you want from your hospitality photography. To find out more, just give us a call. We are always happy to talk through your requirements before you book a photography session with us.